Love and Rockets is dead! 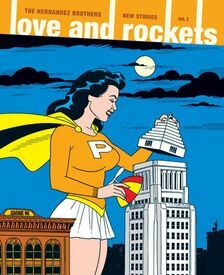 Long live Love and Rockets!! What we mean is: Love and Rockets, Volume 2, the standard comic book size format series which has carried Love and Rockets through the last eight years, is no more. In it's place we have the first issue of Love and Rockets: New Stories, a 100 page annual (Annual? Only one Love and Rockets per year? How will we survive? ¡sob!) 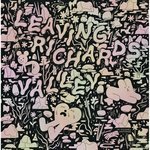 of all new work by the one and only los hermanos Hernandez. This time out of we have a whopping 50 pages (which is, believe it or not, only the first half of this epic yarn) of hi-jinx superheroics delivered as only Xaime can, plus -- count 'em -- six new Gilbert stories and, as an added bonus, a new collaboration betweeen GIlbert and Mario. You'll want to take your time with this one, and savor every moment.